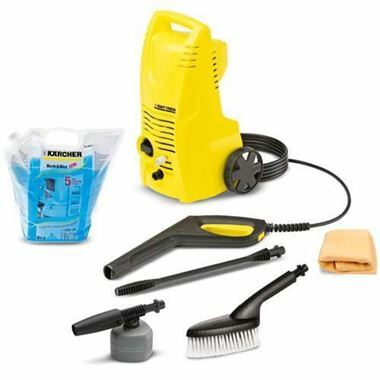 Prevent damage to your car caused by grit on the roads during the winter months using some basic car care with the help of Karcher. New for 2011 is the launch of Kärcher's limited edition K2.21 Salt Removal Kit. Brought to you by the world's number one pressure washer manufacturer, this new kit is the perfect solution to removing winter road salt from vehicles after the snow and icy conditions that have taken hold of the UK in recent weeks. With car damage caused by salt corrosion costing the nation £1.2 billion last year, Kärcher has come to the rescue of UK motorists with its K2.21 Salt Removal Kit. Snow and ice may have made a retreat at the moment, but salt on the roads is still lingering and although an essential part of winter road safety, many drivers aren't aware of the damage it can be doing to underside of cars, metal brake pipes, tyres and even air bags. Heavily salted roads mean that checking your car for salt corrosion is more important than ever not only for safety but also for maintaining its value. The new kit is multi-functional and practical. The foam sprayer nozzle delivers a thorough and deep clean with a thick covering of intense foam lather. It removes salt, dirt and grit deposits effortlessly. What's more, it's suitable for use with on a variety of surfaces. The wash and wax detergent will also help keep your car weatherproof and corrosion resistant. Professor Tony Hindle of Lancaster Management School, an expert in salt corrosion, comments: "Damage to vehicles occurs when coatings of salt are left on the surfaces causing chemical reactions to re-start whenever these come into contact with moisture. This leads to car depreciation, increased vehicle maintenance and part replacement costs. However, there are useful actions that can be taken by car owners such as washing down and drying your car at the earliest opportunity and regular paintwork wax polishes which are both essential in avoiding corrosion." Mark Penrose, Sales and Marketing Director of the Home and Garden Division at Kärcher UK comments: "The solution to corrosion caused by winter road salt is remarkably simple - a thorough wash with the Kärcher K2.21 Salt Removal Kit. Ensuring you clean your vehicle thoroughly is key, not only in keeping it safe, but also in maintaining its value, and with our new kit it couldn't be easier to reduce salt levels". When a person decides to make Home and Garden Improvements to their home, there needs to be a specific reason as to why they deem it is necessary for the improvements. If there is not a specific reason, and they are merely puttering around, the frustration of the whole process may result in a unfinished project and undesirable results for your yard or house.